Dagbamete is a village located in Ghana, in the Akatsi district of the Volta Region. 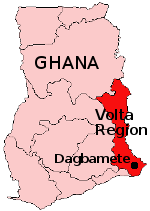 The Volta Region, with the Atlantic Ocean to the south, and Togo to the east, is one of ten administrative regions in Ghana. 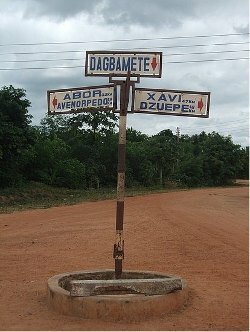 The population of Dagbamete is about 1000. The rural setting, dirt roads, and still common thatch roof huts give the settlement a distinct village feel. Most of residents are related to the founder, Torgbui Zatekpa, who settled in the area in the late 18th century. The village has developed a national and international reputation for its traditional Vodu shrine, for its festivals, and for its summer music school. Hundreds of visitors from America, Europe and elsewhere visit the village each year. Under the dynamic leadership of Chief Torgbui Klu Agudzeamegah II in London and of Acting Chief Hunua Yao Dunyo and the elders in the village, Dagbamete is slowly modernizing itself. The village has running water, electricity, schools, a lodge, and several shops. A new shrine has been constructed. Although many villagers still practice subsistance farming, increasingly the sons and daughters of the village are leaving to study and work in the cities and abroad. But the festivals, the shrine, and family bring them back home where their hearts still remain.